Wednesday, February 19, 6:30 p.m.
Nearly eight centuries ago, twenty-five barons wait, under fluttering pennants, for King John to round the bend in the river. The events of that day underpin our modern concepts of liberty, freedom and justice. But why, and how did Magna Carta come about? What distinguished it from other Great Charters of early mediaeval times? What did it really say and why? How did it then become embedded in the consciousness of the people of England before travelling the world? And most importantly, what does it mean for us today? Sir Robert Rogers is the Clerk of the British House of Commons—an office that dates back to 1363. The liberal arts in medieval times were those subjects studied by a free man—who was free precisely because he was armed and trained in the fighting arts. Much of what is known of 13th-century sword and buckler training is documented in the only surviving fencing manual of the period. John Clements, martial arts historian and director of ARMA (Association for Renaissance Martial Arts), will describe the science of defense developed in this period, as well as the arms, armor and chivalric work of knights. The lecture will be followed by a demonstration. This lecture will be followed by a live demonstration of medieval martial arts. Wednesday, March 12, 6:30 p.m.
Wednesday, April 16, 6 p.m.
Do you have royal lineage? Are you a descendant of a rebellious baron? Genealogy researcher Lynna Kay Shuffield will review tips to help you trace your family to medieval Europe. 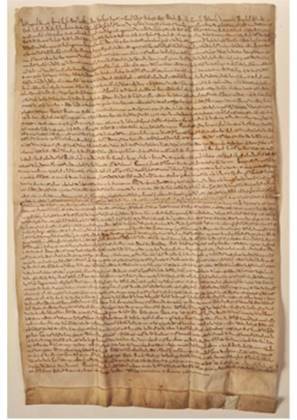 For those with English roots there is a fair chance you may find a Magna Carta link. Over 3,000 Texans are currently registered as descendants of the Magna Carta Dames and Barons from Runnymede. You do not need to be an avid genealogy researcher to enjoy this program. Thursday, May 15, 9:30 a.m. – 3 p.m.
Saturday, June 21, 9:30 a.m. – 3 p.m.
Calligraphy—from ancient Greek kallos for “beauty” and graphe for “writing”— is a visual art dating back to at least 5,000 BC, although our western letter forms were standardized during in the 8th century. In this beginner-level class, Cindy Haller, Houston Calligraphy Guild instructor, will teach you to use a dip pen (our modern answer to the quill) and ink to create the Italic script, and introduce you to the history of English script writing. All supplies are provided and are yours to keep. Participants must be 15 years of age or older. Monday, April 14, 6 p.m.
Tuesday, April 29, 7 p.m.
Aristocratic dining at the time of Magna Carta fused Anglo-Saxon and Norman traditions with exotic flavors and ingredients introduced by Crusaders returning from the Holy Land via Mediterranean islands such as Sicily and Cyprus. In addition, family ties, including the marriage of King John’s sister to William II of Sicily, played an important role in this culinary fusion. Feasting, revelry and courtly manners were important markers of prestige and power. Explore the culinary world of the barons and King John. Tony Vallone and culinary historian Merrianne Timko have created a menu inspired by these historical complexities to delight our modern palates.